The Plantsoen in Leiden is well known for the historical appearance of both the city park (1836) and the houses of the last quarter of the 19th century. The park was originally landscaped on the edge of the city in the place of an old defense belt. 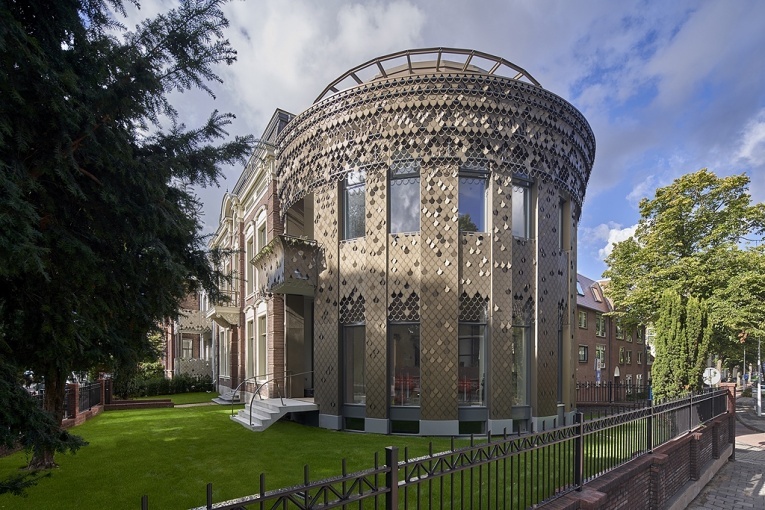 At the entrance of the park at the east side the monumental building Plantsoen 1 – 3 is redeveloped in a complex with 6 apartments. The apartments of about 150 m2 are provided with all luxury and comfort, such as a private indoor garage, spacious roof terraces and an elevator while retaining the historical look and value of the buildings. Redevelopment also applies to sustainability; obtaining Energy label A. Exterior facades, window frames and roof are additionally insulated. The houses are underfloor heated and solar panels are provided on the roof. The municipal monument at Plantsoen 1 – 3 is divided over three floors and a basement. The property at number 1 was originally a fully detached house, number 3 was part of a block of 3 houses. Both buildings date from 1875 and were connected in 1957 and converted into one large nursing home. In this function change, the original qualities have largely been lost. The round expansion at number 1 dates from 1993. In the new layout with 6 apartment, the monuments are restored to their former glory by restoration contractor Burgy from Leiden. The façade of the intermediate building is renewed and aligned with the monuments. The existing façade of the round building is finished with a bronze wall cladding, a ‘veil‘ with a leaf motif. This pattern is inspired by the leaf motifs and decorations of the 19th century, which can still be found in various places along the Plantsoen. The round with ‘veil’ becomes a special recognition point in the inner city. Each apartment has both rooms in the monumental area as well as in the newer parts. The interior of the monumental buildings is provided with appropriate details to bring back the historical character as much as possible. This specific part is provided by Verlaan & Bouwstra architects from Vianen. On the inside buyers have a lot of freedom of choice; they can choose for an even richer historical finish with wall tension, panelling and en-suite layout or a tight, modern finish and layout; both are possible. Each apartment is unique, has its own layout and its own character. Only the view is the same for all apartments; they all look out over the beautiful monumental city park the Plantsoen at the town canal ‘Singel’. The construction has started in the first quarter of 2017. On a piece of wasteland in Leiden between the Lucebert Street and Toussaintkade an apartment building, ‘the Verleyding’ will rise this year. Construction started in March. In the building are 112 rental apartments for young professionals between 18 and 35 years. The properties are suitable for 1- or 2-person households, and have a surface of approximately 30 m2 (one-room apartment) and 45 m2 (two-room apartment). The project is being developed and built by ten Brinke respectively Real Estate and ten Brinke Bouw. After realization the building owner will be SHWJ, Leiden. The housing design is tailored to the needs of SHWJ. The building is 12 floors high and will become a landmark in Leiden. The area is bounded by the railway, a pond and a small park. On the park side the building stands on columns. Under the underpass, the entrance and lift are located. Together with the corridor access therefore an efficient plan has been realized, with 10 dwellings per floor. The upper apartments have stunning views over the city. The view can fully be enjoyed through the large windows. The ground level apartments have their own garden. Residents can cross a bridge over water to the park. Parking takes place on private property. The main body is constructed in a rhythm of frameworks of orange brick. The large frameworks ensure that the building looks less massive and joins well in the neighbourhood. The roof shape refers to the adjacent housing, it is finished with aluminium losagnes. 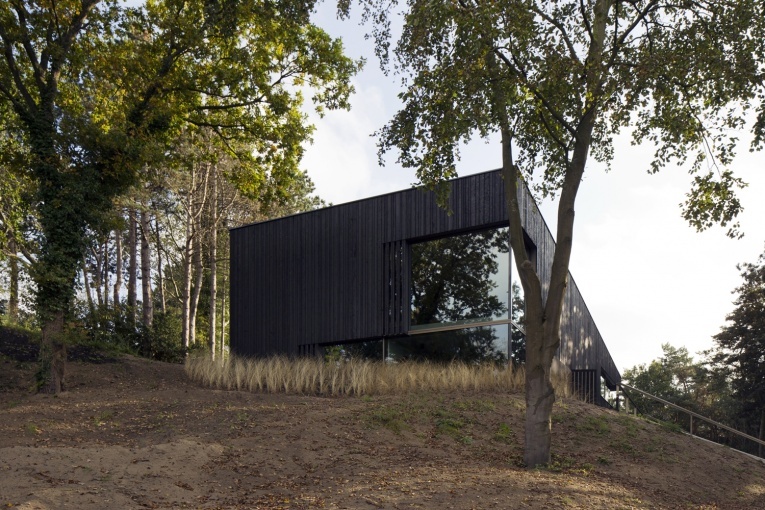 Villa Meijendel takes its name from the nature reserve in which it is located, where a forest meets a valley of dunes. The house is constructed from concrete and set into the side of a sandy slope. The building's design aims to create a dialogue with its surroundings, both through the way the form and materials engage with the landscape, and through the use of glass to provide views out from and into the house. The boxy geometric structure is entirely clad in charred timber, creating a textured black surface that appears different depending on how sunlight falls on it. The exterior finish, inspired by the ancient Japanese shou sugi ban technique, also helps to preserve the wood. Sometimes the house is almost invisible against the dark edge of the forest, sometimes it sparkles in the sunlight because of the glittering charred wood, as such forming a background for the play of shadows of tree trunks and branches. The villa hides and reveals itself in the landscape. The property has its entrance on a middle level accommodating an office and two bedrooms. Stairs ascend to an open-plan kitchen and living space, and drop down to a master bedroom and gym room. The living room features a full-height corner window that looks out through the trees towards the dune valley. A lower window facing to the rear and a large glazed surface lining the adjacent double-height circulation area face out onto the forest. At the far end of the first floor, sliding glass doors lead out from the kitchen onto a terrace. The material palette –concrete, steel and anodised aluminium– was chosen to complement the tones and textures of the surrounding environment. Each material is applied in a raw, untreated form. Internally, the walls are finished with smooth concrete, while the rough-sawn Douglas fir beams supporting the ceilings feature a distinctive grain. West 8, Adriaan Geuze, is responsible for the garden design. The team with VVKH Architects, Dura Vermeer and Besix has been selected for the design and build of a five-story underground parkinggarage in the historical center of Leiden. 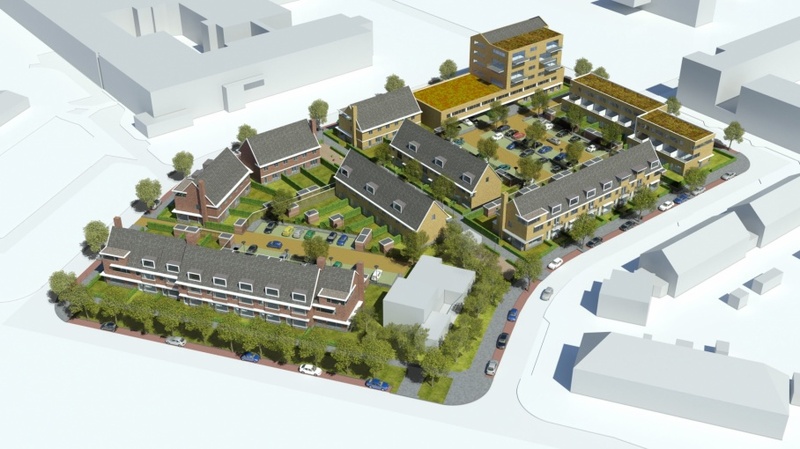 In cooperation with Smits bouwbedrijf, VVKH has won the european tender to develop a new housingarea in district Dieperhout in Leiden. The project consists of 48 dwellings, 12 apartments and a care facility of 1500m². Start of the constructionwork is planned in may 2015, because thats when a current school will move to a new building and the site will be available. 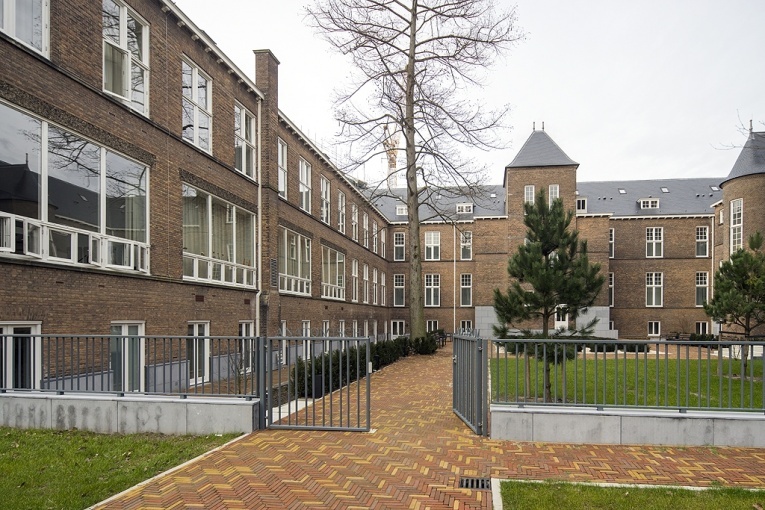 On the Boerhaave Campus, part of the Bio Science park in Leiden, the historical anatomy-building has been transformed into housing for Phd-students and researchers of the Leiden University. The new apartments are characterized by their high ceilings and old constructions. A small mezzanine is created to function as a bedroom. Right beside the existing building a new appartmentbuilding is erected, designed by Van Gameren of Mecanoo Architects. The total complex contains 166 apartments and is the first step in the complete transformation of the Boerhaave Campus. House Hilde lies on the dunes, on the tourist route between Station Castricum and dunes. The building opened in January 2015 and combines a depot with a museum function. The archaeological center is named Hilde, a woman from the fourth century AD and found in 1995 during an excavation in Castricum. Hilde house was commissioned by the Province of North-Holland. Every Dutch province is responsible for the preservation and exhibition of archaeological finds within its borders. The old depot of North Holland in Wormer was too small, the climate was bad manageable and it was only limited accessible to visitors. The building on the Zanderij in Castricum offers plenty of space for storage and exhibiting archaeological finds and collections. Hilde house has a floor area of 4,480 m2 and is divided into a pavilion and an underground depot. The building is designed with the surrounding landscape. The draft refers to an old dune landscape (so called “nollen” landscape) that is much older than the current shifting sand dunes and can still be found at various places in North-Holland. In the aboveground elongated pavilion on the one side the main entrance, with desk, museum shop, and a space for temporary exhibitions, cloakroom and toilets are situated, on the other side the office staff. On the first floor is a small restaurant with terrace and auditorium. The elongated shape and the 70-meter roof of the building refer to the early medieval farms, as they have been in the area. The curved roof structure is finished with Corten steel sheeting as a reference to thatched farms. The large overhangs of the roof protect the interior from direct sunlight, which allows the use of large glass surfaces. The façade is decorated with stone from Morocco, fossil pintail squid in it, a reference to the archaeological feature of the building. This stone also comes back into the interior. The depot is about 2,200 m2 and is divided into several archives and the centrally located exhibition space. The hilly “nollen” landscape is, as it were, pulled over the depot. By placing a meter of sand on top of this part of the building a stable climate is achieved in a passive way and only limited installations are necessary in order to maintain a constant temperature and humidity in the depot. By putting strong in design and construction on sustainability House Hilde has an average score of 8.6 on the sustainability label. In addition, the integration of buildings with the landscape certainly has a symbolic value: in the ground is the best place to preserve archaeological treasures. 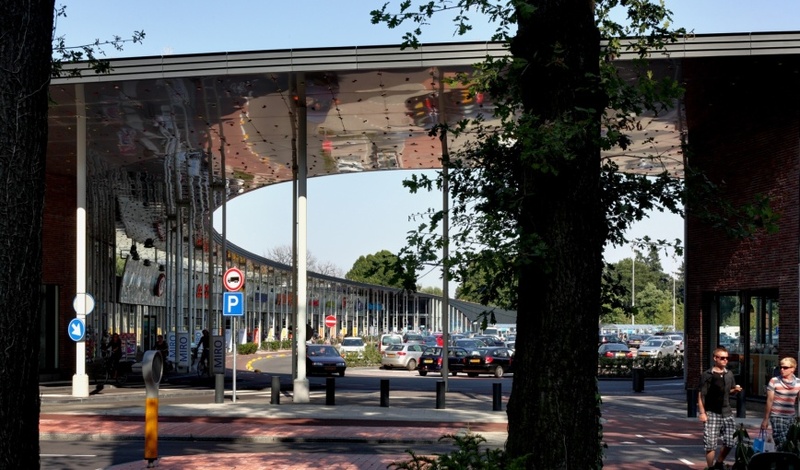 Home and Living Mall Ekkersrijt is located on the north of Eindhoven, directly at the highway A50. 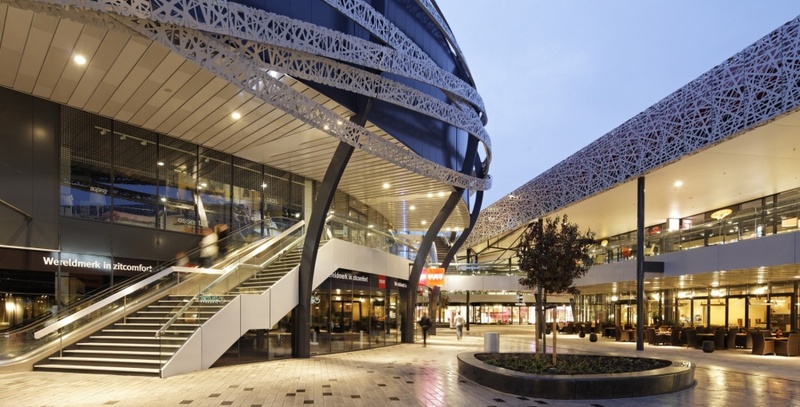 In 2013 the existing shopping mall (21.000 sq.mtrs) has been extensively renovated and expanded with 24.000 sqr.mtrs. The existing building was outdated and made up of separate buildings, with closed unattractive facades and entrances, shop windows only facing the courtyard. Experience and length of stay have been central themes to the renovation and expansion. The new complex has been given a contemporary, modern feel. Old, loose components and constructions are forged into a recognizable, homogeneous unit, which is easily visible from the public road. In addition, a pleasant living environment has been created for visitors. The original stores remained open during this major redevelopment. With intensive consultation and coordination between designer, consultants, tenants and builder the inconvenience during the construction has been limited to a minimum. With this transformation the center has been made future-proof. Existing shops have been given new facades to meet with the requirements of present times and to become one with the extension. Besides facades also the roof has been thoroughly upgraded and installations (among others sprinkler system) have been replaced, modernized. Signing is carefully incorporated and nowhere predominant. 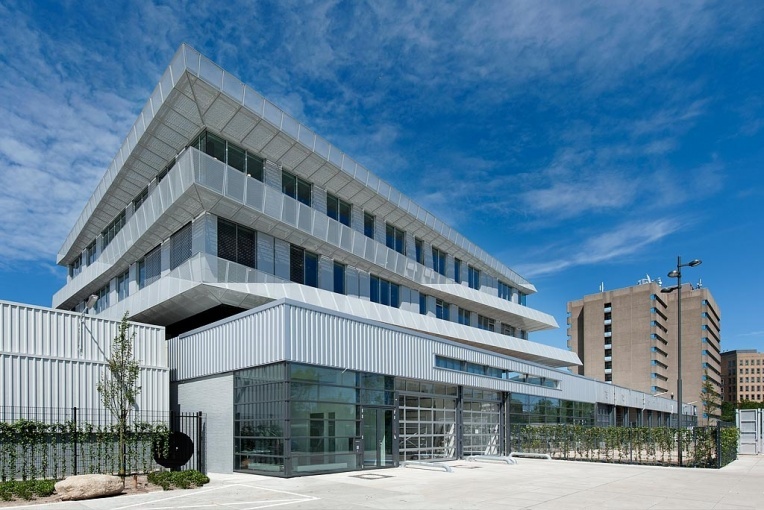 The new building has a distinctive façade of metal with a specifically, laser cut pattern. Recessed into the façade are the neon signs and the ramps to the parking deck. The movements of the cars on the ramps provides extra dynamism in a natural way. On the former courtyard a freestanding oval new shop building is made. This building forms the heart of the new home and living mall and is, due to its special design, an icon to the highway and nearby. From the parking deck visitors reach the heart through walkways and they go with elevators and escalators to the open and indoor malls on the lower levels of the complex. Shops on the upper floors thereby have the same run as on the ground floor. Because of the oval building shopping at ground level has a pleasant scale with shops on both sides. At the Duurstedelaan in Utrecht lies one of the most sustainable schools of the Netherlands. The school is centrally located in a reviving neighbourhood, in the south of Utrecht and accommodates three primary schools, a nursery and a broad programme of functions related to the school and local community. Future users participated from the start in the design-process. Different users gain with collaboration, but also want to be recognized and have their own specific needs. All functions are organised round a collective court space. The gym is constructed above this space and thus forms the roof of the court. The building is set up in red brickwork that is continued in the playground boundaries. The identity of the different schools is reflected in their own colour and pattern in het façade panelling and silhouette of the building-mass. The whole setup matches with the urban scale of the neighbourhood and blends in naturally. 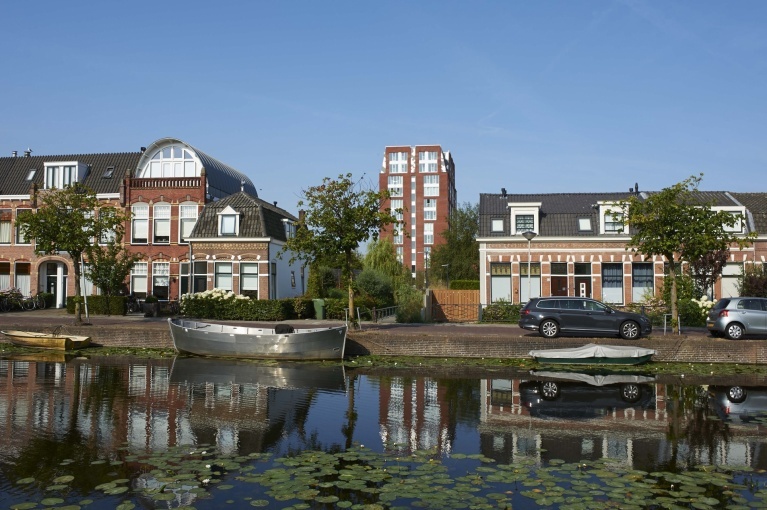 The plan ‘de Biezenhof’ is part of the new residential area ‘Waterrijk Woerden’ and is situated along a natural watery region. The urban scheme of ‘Waterrijk Woerden’ was designed by West 8 and refers to the traditional Dutch water cities such as Delft and Leiden. The design is made in collabiation with Klunder architects. Almost every dwelling is individual and has a specific connection to the water. The plan of Biezenhof is divided in two parts: there is one block of family houses around a courtyard on the edge of the lake, and there is a row of water houses and apartments along a canal. The buyers of the houses could choose between several types of houses as well as between four architects. Due to the possibilities in combining type and architect, not one house is the same. Every house has a singular character: the lake houses have a beautiful view on the lake, the street houses have a garden, and the canal houses enclose big terraces. In the public space there are a few parking places, the majority of parking places are organised in garages. The houses designed by Knappers are characteristic because of the huge roof overhanging the façade. This contributes to the shelter-against-the water identity of the houses, and refers to the greenhouse glass constructions in the low lands. At the street side these houses are made of brick, which gives them a closed and open (to the light and the water) individuality. On the east side of Enschedé, on the outskirts of the city center lies the Miro shopping centre. The former mall has gradually been replaced by new buildings and was worn out. The new building has a curved façade and a large canopy. It embraces the public space and the high-quality parking facility. The shopping facade ends on the east side in a shopping arcade, which contains a large supermarket. On the west side the arcade accumulates into a two storey development. Together with public buildings on the other side of the road the building forms a port that marks the transition from the green suburban neighbourhood to the city itself. The complex includes a green roof that connects on the east end to an ecological zone for butterflies and bats. This new building had become a recognisable beacon on the edge of the city of Assen. 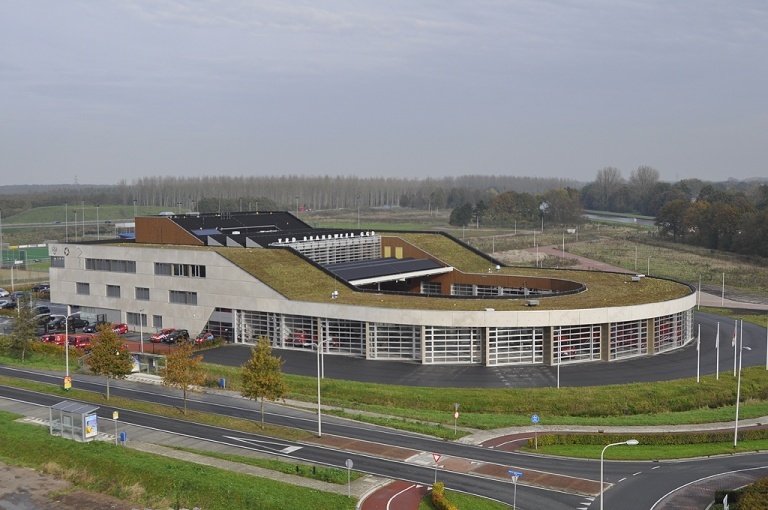 The building accommodates several emergency services such as a firestation, the Area Health Authority and the Safety Region Drenthe. Together with the Koopmans Bouwgroep, VVKH won the design & build competition. The new building is compact, sturdy looking and radiates preparedness for an emergency. All functions have been placed under a single roof, organised around a central atrium. From the atrium there’s a view on the court yard where fireman are practicing. The firetrucks are stationed around the court yard, ready to tear out. Offices are concentrated on the higher floors overlooking the highway A28. 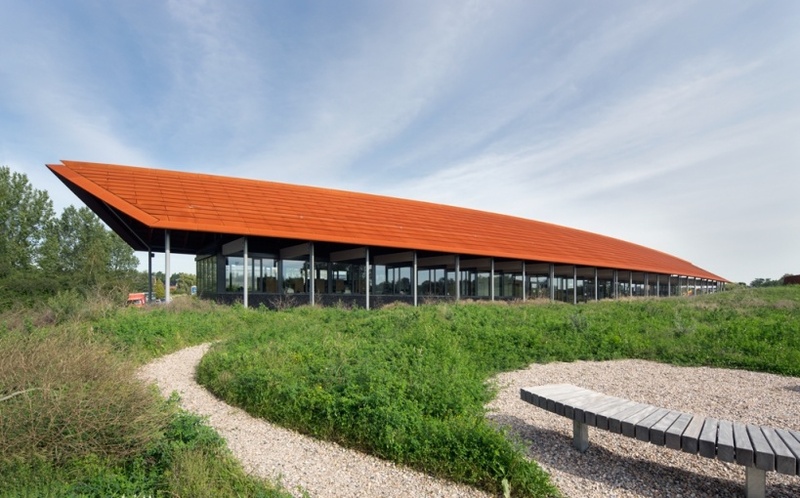 The building has a very high sustainability-rating (Dutch GPR-score 8,0). A former Mercedes showroom is rebuild to become the regional ambulance station. From here thirteen ambulances are ready to tear out in an emergency. On top of the existing showroom an new building with offices and a hightech trainingcenter is oriented at the a busy railwayline. The new part is a sturdy building with overhanging balconies which provides shade in summer and window cleaning. In the front facade, at the Vondellaan, a small ambulance museum is created.